To explore the gap between wheat as commodity and wheat as food, artist Sarah Kavage bought—and took possession of—1,000 bushels. Sarah Kavage at "We Are All Beginners Here"
Opens Sat 8/7 with a reception, 6-10 PM. Then through 9/4, Thu-Fri 4-7 PM, Sat noon-6 PM, and by appointment, Roots & Culture, 1034 N. Milwaukee, 773-368-5875, stopgostop.com/nca/webegin.html. 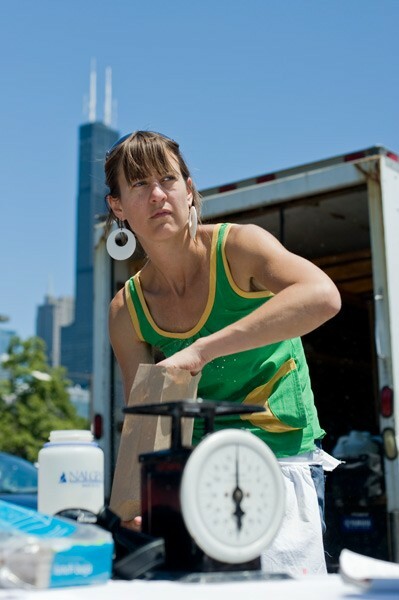 In two hours on one scorcher of a recent Tuesday, Sarah Kavage gave away 110 pounds of flour. From behind a folding table set up in a UIC parking lot, she and a helper greeted a small but steady crowd of farmers' market shoppers, many of them staff at the university and nearby Hull House, which hosts the weekly market in the lot. The two of them jotted down each name in a ledger and then carefully bagged up one- and two-pound allotments of flour, bending over to dip a Pyrex measuring cup into 50-pound sacks of all-purpose and whole-wheat pastry flours with almost mechanical regularity. "Don't forget to refrigerate it," Kavage told a shopper. Tall and striking, in a green tank top and chunky white earrings, she wiped her hands on a thrift-store apron stamped to hell with housework! in neon pink. "If you do, it should last at least six months." The all-purpose is good for bread, she continued. The pastry flour's best saved for pie crust, pizza dough, or biscuits. If you try to use it for yeasted breads, she added, "you'll wind up with a brick." "This stuff is going!" she said, when there was a break in the stream. "I've been working!" But those 110 pounds were just a drop in the bucket. She still had 18,000 more pounds to go. Kavage, a 38-year-old Seattle-based artist and urban planner, is in town to execute an elaborate, summerlong project she's calling "Industrial Harvest," which she describes at industrialharvest.com as "an artistic gesture of Herculean proportions about nourishment, food systems, and the City of Chicago." She arrived in mid-June, after a three-day train trip that took her across the wheat belt of North Dakota and Minnesota, just as a semi-truckload of wheat with her name on it was being delivered to a miller in northeast Indiana. With the help of a grain broker she'd bought the wheat—1,000 bushels of the soft red winter variety grown across Illinois, Indiana, and Michigan—for just under $5,000 as the delivery price for wheat hit $4.89 a bushel. She had the grain milled into flour and shipped to Chicago, and then she started to give it away: to food banks, to soup kitchens, to bakers and passers-by, for free, on the condition that they use the flour to "nourish others" and drop Kavage a line letting her know how they'd done it. Industrial Harvest is the first project she's done that deals with food. Her artwork more often reflects her training as a planner, exploring a particular place and its history and future. But Kavage, raised in rural Ohio and a Seattleite since 1998, had never thought much about Chicago until 2006, when she entered the CTA's competition to design art for newly rehabbed stations on the Brown Line. Her proposal for a tile installation at the Damen stop didn't win (though she was a finalist), but while she was researching the city's history and neighborhoods, a friend suggested she read William Cronon's Nature's Metropolis: Chicago and the Great West. Cronon's 1992 history looks at Chicago's rapid 19th-century evolution from frontier outpost to national hub of transportation and trade, and at the powerful role of the railroads and the Board of Trade in defining the city's identity as the buyer and processor of agricultural goods—specifically timber, grain, and cattle—from across the inland U.S.
"Trading grain," Kavage says, "used to be this very intimate relationship between the product and the buyer and the seller. Before there was the Board of Trade you would come to the waterfront and you had your little sacks of grain loaded up on your wagon and the buyers and sellers are looking around for each other and the buyers are examining the crop and trying to set a price and the price is determined based on the quality of the individual crop. "But the problem with that system was that around harvest time farmers would bring their grain to market but because everyone was harvesting at the same time there would be this huge glut." And when supply exceeded demand, "a lot of farmers just wound up dumping their grain on the waterfront." From this inefficient system was born the incomprehensible world of modern commodities trading. To stabilize the market the city invested in grain elevators and railroads, which made it possible to store surplus until the lean months of winter and ship large quantities of grain to buyers around the country. But scale necessitated standardization. With farmers from across the midwest depositing their crops in Chicago, fixing a price on a particular lot of grain became impossible. Commodity crops were graded and sold on contracts, and contracts begat forward contracts, the precursor of today's futures contracts, allowing buyers to fix a price today for a unit of grain to be sold tomorrow. Forward contracts opened the door for speculators. "A light went on somewhere," says Kavage. She'd grown up listening to the farm report, she says, but "I had never really thought much about the commodities system or the Board of Trade. I really wanted to see how this system worked." In 2008, after Chicagoan Anne Elizabeth Moore invited her to guest blog on her site Democracy Guest List, Kavage hatched a vague plan to buy a unit of some commodity on the Mercantile Exchange and then, somehow, get into the pits to trade it herself. She was looking forward to the last part, drawn by the "gay disco quality" of that subculture of cryptic hand signals and garish blazers. That, however, quickly proved impossible, as you have to actually own a seat on the exchange to get onto the floor. And anyway, open-outcry trading had by then largely fallen by the wayside, a casualty of digital technology and the 2007 merger of the Merc with the Chicago Board of Trade. But that same year a global food crisis sparked riots around the world and added an estimated 250 million people to the ranks of the global hungry as the price of staple foods shot sky-high. Commodity crops were headline news, and Kavage couldn't shake the feeling she was onto something. Over the following year she returned to Chicago twice to learn more, doing residencies at Nance Klehm's Urban Homestead and the arts collective InCubate and making connections with both artists and commodities traders. She settled on wheat (rather than corn, say, or hogs) because "it's got such a long history as a staple crop—it's kind of the original commodity." Plus, she adds, "It's so symbolic. There are all these traditions around baking bread and metaphorically it's this foundation of nourishment. It's all over literature and politics, and just has this heavy imprint on our culture." Still, even as she fleshed out the structure of Industrial Harvest—and started to beat the bushes for the $15,000 she estimated the project would cost—she couldn't help wondering: "Does anybody even bake anymore? Who really cares about wheat?" In June, as Kavage was chugging east from Seattle on the Empire Builder, the July issue of Harper's was hitting newsstands. The cover story, "The Food Bubble: How Wall Street Starved Millions and Got Away With It," analyzed the 2008 food crisis in the context of the futures market and the wild rise of the price of hard red winter wheat—the high-protein staple that is one North America's most bountiful and reliable exports. Its value peaked on February 25, 2008, at a record high of $25 a bushel. Much as the mortgage bubble has been pegged to AIG's reckless embrace of credit default swaps, the author, Frederick Kaufman, pins the spike in wheat prices—and the subsequent riots and starvation—on Goldman Sachs. Specifically, he blames the Goldman Sachs Commodity Index, a 1991 invention that Kaufman recently described to an interviewer on public radio's Here and Now as "an ingenious and subversive . . . way of treating these commodities not like what they were—in other words real things that people had real uses for in order to feed people—but just [as a] pure, mathematical formulation of money." 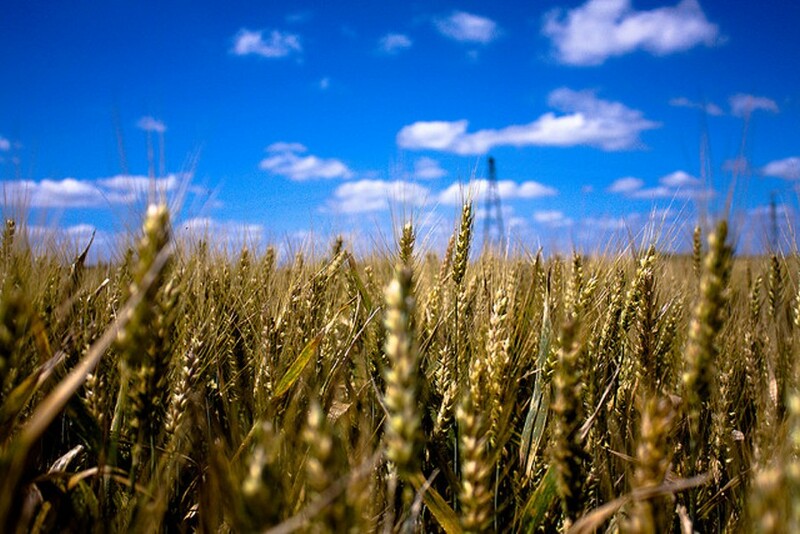 The North American wheat market, Kaufman pointed out in Harper's, was able to prosper thanks to numerous mechanisms that protect farmers and consumers from wild swings in price—things like futures contracts, which allow millers and bakers to stabilize their costs. But what's good for farmers isn't necessarily good for bankers. Bankers like volatility—that's how they make money. Kaufman's article, in brief, argues that the Commodities Index, by allowing speculators to perpetually roll over futures contracts without ever having to actually buy any wheat, created an artificial demand for wheat, driving up prices and causing panic around the world at the perceived shortage of wheat in a year that, ironically, saw one of the most robust crops of hard red winter wheat in years. Goldman Sachs, needless to say, took issue with this. An indignant July 8 letter to the editor relocates the blame for the food crisis on an Australian drought and the intersection of increased meat consumption and biofuels, accusing Kaufman of trafficking in "conspiracy theories." But for Kavage it was gold. At the Hull House farmers' market, photocopies of Kaufman's article sat next to handouts on her project and recipes for whole-wheat pizza. 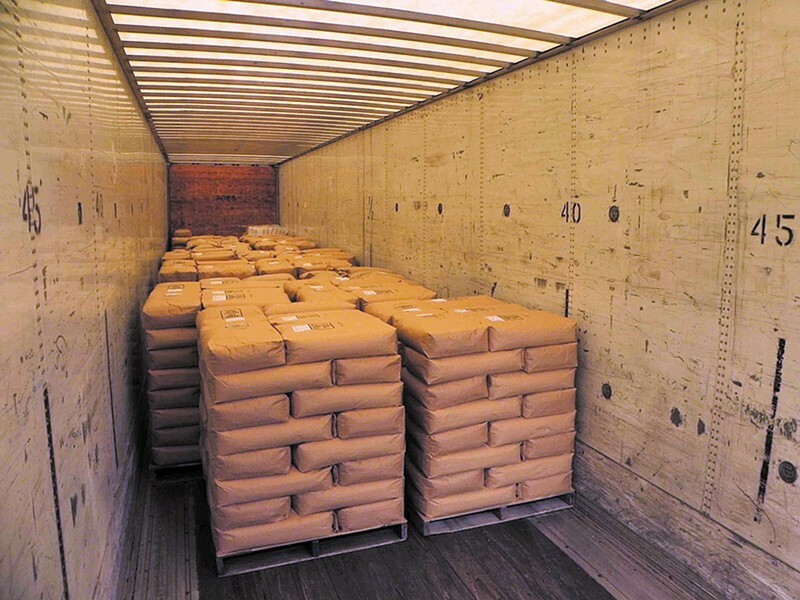 If you deal in large enough quantities of wheat on the Board of Trade, it's technically possible to take actual delivery of a futures contract and have a load of grain dropped on your doorstep. 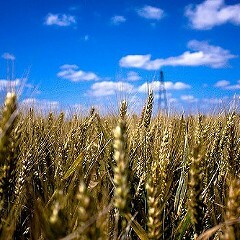 But very, very little wheat trading results in the exchange of actual grain for money. It's different for different commodities, says Mary Haffenberg, a spokeswoman for CME Group, which owns the Chicago Board of Trade and the Mercantile Exchange, but for wheat it's about 3 percent. Instead, the practice serves two seemingly contradictory ends: it allows bakers, millers, and others whose business involves actual wheat to stabilize their costs, and it gives speculators a chance to make money. Kavage had originally hoped to be in that 3 percent, but that proved logistically impossible. Before she got to town she bought a futures contract and used it to hedge, or lock in a price to offset the risk of the price of wheat rising. She wound up losing a few hundred bucks on that deal, as the market started to fall soon after she placed her order. And it turned out she couldn't have taken delivery of the wheat from that contract anyway. The wheat traded on the futures market is relatively low grade—most of it winds up as animal feed. On top of that, heavy rains and cool weather last year led to a less-than-stellar crop, and by June, just before the next harvest, decent food-grade wheat was getting hard to come by. So though Kavage had originally hoped to buy her wheat from the massive Port of Chicago elevator on the Calumet River—through which pass 13 million bushels of grain a year, and which set "Stacker of Wheat" alongside "Hog Butcher for the World" in Carl Sandburg's legendary coinage—she ultimately had to go to plan B. The grain stored there just was not up to snuff; it could have been used for food, but only if chemically treated and highly processed. Since Kavage was working with a smaller-than-normal amount (1,000 bushels is a "mini-standard unit" in trading lingo; 5,000 is standard) and because she wanted people to actually be able to cook with it, she turned to a broker to help her buy some grain that met the rigorous specs of her miller, Greenfield Mills in North Howe, Indiana. 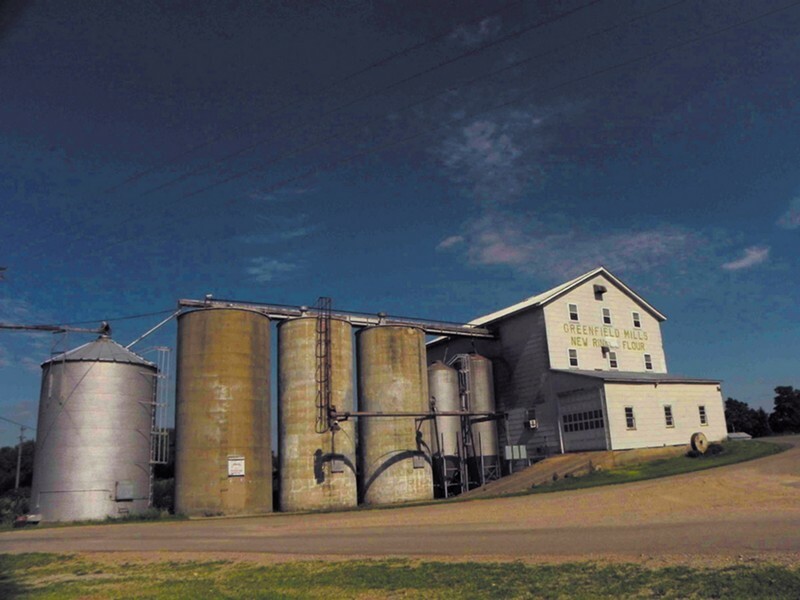 Greenfield is a 106-year-old hydropowered mill owned by Dave Rinkel and his family, the fourth and fifth generations of Rinkels to run the business. For years Greenfield Mills operated around the clock, grinding flour for Kentucky Fried Chicken breading in five states—until in 1986 KFC was bought by PepsiCo, which took its business elsewhere. In one fell swoop Greenfield lost its biggest client, and since then, says Dave Rinkel, they've focused on smaller accounts: grocery stores, Amish bakeries, pie shops. "With the economy the way it is," he says, "it actually pays better." Greenfield was certified organic in the late 80s, but Kavage's wheat is not. To mill her order they had to clean out the whole operation before and after. Still, says Rinkel, he thought it was a neat project so he was willing to put in the extra effort. "For a girl her age to go out and purchase grain and grind it into flour to give away to food banks and rescue missions, it takes a lot of initiative. . . . I think it's interesting when young people get involved and see what this business really means, because a lot of people think the stock market is just for making money." "I don't think people realize how tangible these markets are to our everyday needs and pocketbooks; there has to be somewhere that the prices are agreed upon," says Haffenberg. "Otherwise it would be chaos! It was actually interesting to talk to Sarah because we don't get to talk to artists or people like her very much." Kavage's project is "pretty unusual," says Dave Lehman, managing director of commodity research and product development for CME, "but I actually think it could be quite helpful to most people in the street, who don't really understand that the function of the market is for price discovery and risk management, and that it actually has this connection to the cash market. . . . It's a very instructive project to actually create a mechanism to follow that grain from production to consumption." 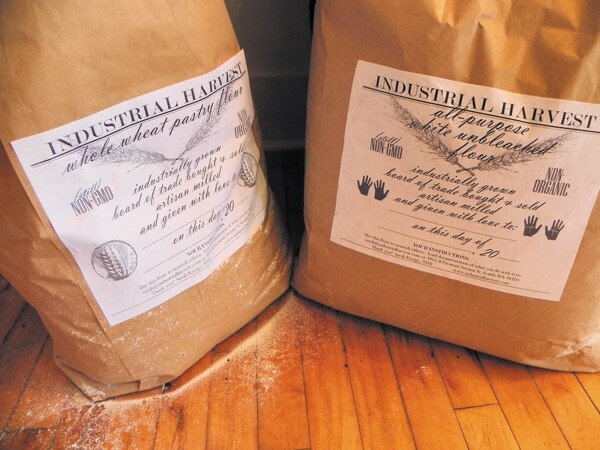 A few days after the flour was milled, Kavage stood in the Archer Heights warehouse of the Greater Chicago Food Depository, marveling at nine pallets stacked 40 bags high with 50-pound sacks of Industrial Harvest flour: nine tons, about half her entire output. Each bag had been stamped by the mill with a quote from John 6:35: "I am the bread of life; he that cometh to me shall never hunger." In the context of the cavernous warehouse, Kavage's nine tons looked minuscule, but she looked thrilled. The Food Depository was going to use her flour in its Chicago's Community Kitchens program, a free 14-week course that teaches unemployed adults the culinary skills to obtain entry-level work in the food service industry. Some of it would also go to food banks and soup kitchens in the agency's network. Between now and November Kavage is distributing the rest of the flour wherever she can. In addition to the small bags she's giving away at farmers' markets, she's donating in bulk directly to other hunger-relief outfits, like the Fraternite Notre Dame in Austin, whose nuns took another ton off her hands. Last week she gave a talk at Kendall College, where an artisanal baking class used her flour to make flatbread pizzas in an outdoor brick oven, and earlier this week she collaborated to put together the first of several dinners with Sunday Dinner Chicago, a small catering company with a local, sustainable focus. In July she drove to Reedsburg, Wisconsin, to distribute flour as part of an exhibit called "Women in Grains," organized by Chicago artist Cathi Bouzide, whose preferred medium is corn. And she's participating in another exhibit opening this weekend at Roots & Culture gallery in Wicker Park. For that, Kavage says, she's hoping to pass out pizza on the street, as well as construct some sort of "immersive wheatgrass experience" inside the gallery itself. For a complete list of events scheduled so far, see her website, industrialharvest.com; individuals and agencies interested in a bulk donation can fill out the "bushel grant" application on the site. If she can't get rid of all the flour by November, she says, the Food Depository will take the rest. "The last thing I want to do is make this big gesture and then have it go to waste," she says. "I don't want to just make a statement. I really want to feed people." "Do you know the obligations that come with this gift?" Kavage asked a pair of farmers' market shoppers. "Share it with other people, feed your friends—and then send me an e-mail or a picture and let me know what you did with it." Darlene Garay, who works in the administrative office at UIC, was going to take a stab at bread, though she admitted she wasn't much of a baker; her friend Miki Saladin was thinking strawberry pie. A trio of med students, in Chicago from New Orleans for a residency at Rush, planned to bake a fruit tart, while Anna Barnes, a part-time student in public health, was going to make something to share with her supper club. Nancy Cohen was taking her pastry flour to Boston, where she was headed to care for her father, who was having colon surgery. "I'm going to go fatten him up with desserts," she said. "Is this the free flour?" was the first line out of many shoppers' mouths, but, said Kavage, it's cool if that's as far as their engagement goes. "I would imagine that I will never hear from some people again," she said. But "even if people don't get it on one level, they get it on another. 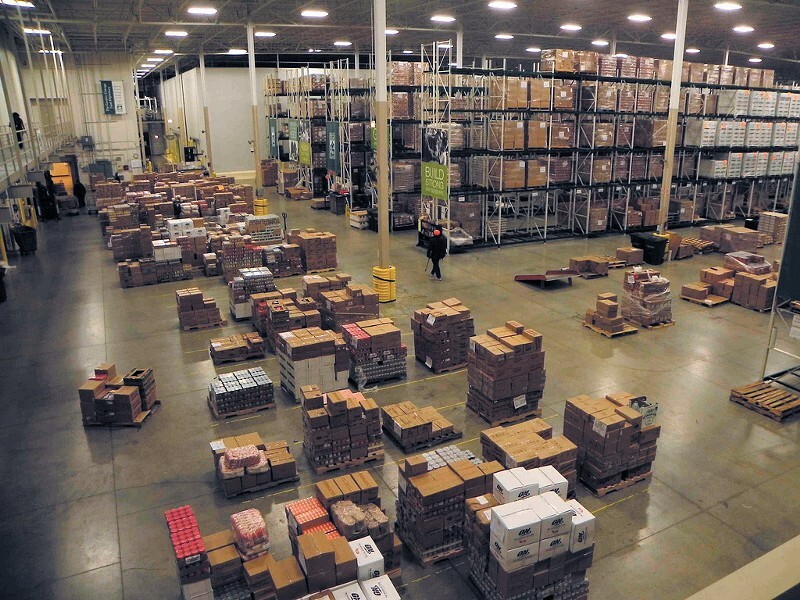 Even if they don't understand all the logistics of commodity trading, it's pretty easy to explain that this is an institution that has a huge influence on the food we eat." Margaret Schneeman, a PhD candidate in economics at UIC who lives in Woodstock and "does a lot of food sharing," told me she was going to make a quiche. Kavage's project is cool, she said, "because she's taking the Slow Food movement—which is, to be honest, sometimes seen as sort of nutty, crunchy, and elitist and all this—and connecting it back to an actual policy mechanism. . . . It forces you to think about some of the reasons why you may not actually want to have Slow Food, because it actually evolved this way [for a reason], versus why you might."